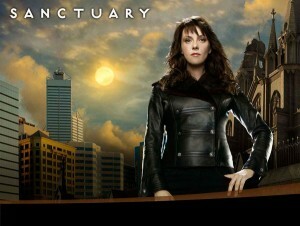 Sanctuary, one of the most imaginative, clever and well-realised shows on television, which focused on a bunch of unique individuals led by the enigmatic Dr Helen Magnus (Amanda Tapping, Stargate SG1) whose mission was to protect the Abnormals who shared this planet with homo sapiens, was cancelled this week by syfy. It seems to be making a habit of axing shows with plenty of life left in them with Eureka another example of this disturbing trend. While I understand how the mechanics of television finance works, and that shows become progressively more costly as they age till they reach a tipping point where the costs become prohibitive, nonetheless, syfy seems to be axing shows that I would have thought could have gone at least 1-2 more years at least. Having said, when delivering the death notice, they at least said some warm and fuzzy things about the show which while small comfort to the fans, at least acknowledged the great contribution this show made to the television industry specifically and the art of storytelling in general. “We couldn’t be prouder of the four seasons we made on Sanctuary. We are very grateful for the opportunity and must acknowledge the wonderful work from our cast and crew, the support from our studio, the Beedie Group — who have been with us right from the start, the networks who worked so hard with us each week, and most of all the fans…we owe so much to the fans. The show will be greatly missed. * I will leave you with Amanda Tapping and Robin Dunne being interviewed by tvweb at Comic Con in 2011.